Unexplained hair thinning and hair loss can give you sleepless nights. There is nothing more distressing than seeing your lovely locks fall out. The good news is that in most cases it is possible to treat it. It all depends on the cause. Everyone loses hair. So, if you see few stray strands on your hairbrush don’t panic. Hair is made up of a type of protein called keratin that is produced in hair follicles. As the follicles produced new hair cells, old cells are pushed out through the surface of the skin. Every strand that you see is actually composed of dead keratin cells. Every strand has a life cycle – growth, rest and shedding phase. Several factors can shock this hair cycle and cause hair loss that is more than normal. According to Web MD, “the average adult head has about 100,000 to 150,000 hairs and loses up to 100 of them a day.” It’s also true that men are more likely to lose their hair than women. Hair loss may be a sign of a serious condition, a bad diet or a vitamin deficiency. Hereditary hair loss or androgenetic alopecia is the most common cause of hair loss. The genes can be inherited from your parents especially if they also had hair loss. Genetics may influence the gradual reduction in the diameter and length of individual strand, simply put it may cause hair thinning. This is more common in men as male hormone testosterone naturally converts to DHT, a hormone which can make the hair follicles shed prematurely and cause them to shrink. This makes men more susceptible to baldness. Stress is also one of the primary reasons for sudden, unexplained hair loss. Sometimes hair loss may be due to certain temporary factors that can be tamed. Before you take the plunge into treatments, pills and products, take a look at what’s on your plate. It’s is not just about a healthy diet, your hair cells require proteins, complex carbohydrates and iron to grow and function. The hair cells are the fastest growing cells in the body but they are also the first ones to be affected you don’t eat right or suffer with deficiencies because they are not required for survival. All the nutrients that you consume are first sent to the parts of the body that really need them like the heart, liver, kidneys and then what’s left benefits your hair. This makes it important for you to consume the right nutrients and in the right quantities. Iron deficiency is more common in women of childbearing age than men and postmenopausal women. In this case, the blood doesn’t have enough red blood cells which transport oxygen to the cells and give you the energy that you need. What fuels your body is also needed to boost hair health. When hair follicles grow, they require a lot of iron. Women who regularly have heavy menstrual periods are at a high risk of becoming iron deficient. This makes iron deficiency one of the most common causes of hair loss among women. Your doctor may ask you to get blood level of hematocrit checked, which reveals how much of your blood is made up of red blood cells. In most cases, an iron deficiency is detected only when the levels fall really low and when you see symptoms like extreme fatigue, paleness, shortness of breath and anxiety. By this time, the deficiency may have already affected your hair health. According to the World Health Organisation, “The numbers are staggering: 2 billion people – over 30% of the world’s population – are anaemic. In developing countries every second pregnant woman and about 40% of preschool children are estimated to be anaemic.” The National Family Health Survey-3, 2005-06 (NFHS-3) shows that about 55.3% Indian women as anaemic. It further states that 46.1% women belonging to the top 20% households—are anaemic, too. Among moderately rich, 52.2% women are anaemic. Thus, it is not a problem of poverty but of dietary habits. “Iron deficiency can be assessed by getting your hemoglobin levels checked. For women, it should be between 9 and 11. The ideal is 12. For men, the range lies between 11 and 13. Besides this, you may also have to get other tests like Total Iron Binding Capacity and Serum Ferritin. 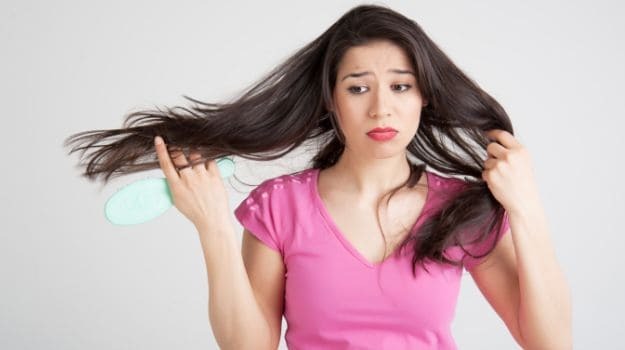 If you have a healthy woman losing hair it is most likely due to iron deficiency. 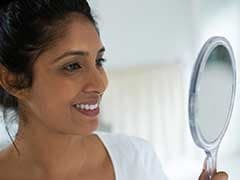 You should also get your Vitamin D and Vitamin B12 levels checked, these deficiencies can also cause hair loss,” says Dermatologist Dr. Deepali Bhardwaj. Meats especially red meats are a great source of ferritin, a type of stored iron that helps the body produce hair cell protein. Other iron-rich foods like green leafy vegetables, fish, pumpkin seeds, nuts, beans, chickpeas, soyabeans and cereals should be added to your diet. It is also important to pair these with foods rich in Vitamin C which enhances the absorption of iron in the body. “You must include 12 milligrams of iron in your daily diet,” recommends Dr. Simran Saini, Nutritionist at Fortis Hospital, New Delhi. A single strand of hair is made up of protein fiber which means that it requires an adequate dose of protein to grow. If you do not consume enough protein, your body will ration the quantity available by cutting off the supply to the hair follicles. If you don’t eat enough protein, your hair is likely to become dry and brittle. Every cell requires protein for life; they are needed for tissue repair and for the construction of new tissue. At a particular time, about 90% of your hair strands are in the growing phase which can last for two to three years. Once this phase is over, they enter into a resting phase for another three months and finally they shed and are replaced by new strands. If you don’t have enough protein in your diet, a large number of strands may enter the resting phase at the same time and hair loss may become evident. According to a recent survey conducted by the Indian Market Research Bureau, 9 out of 10 people in India consume inadequate amount of protein. Vegetarians showed a higher protein deficit (91%) as compared to non-vegetarians (85%). According to Dr. Simran Saini, “Your daily protein intake should ideally be 30% of the total calorie count that one consumes.” Non-vegetarians can get their dose of protein from meats, fish and eggs but vegetarians need to supplement their diet with other complete sources of protein. Complete proteins are those that contain all essential amino acids such as cheese, milk, soy, legumes, lentils, green peas, quinoa and yogurt. Amino acids are the building blocks of protein, there are eight essential amino acids that the body does not produce and must be derived from your diet. 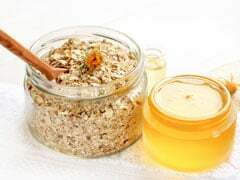 When you flip through the pages of a magazine or hover over the internet, you may be flooded with numerous advertisements for hair products and treatments, but the best kept secret for those long and lovely locks can be found in your kitchen pantry. 1. Add iron and protein to your diet, they are the two basic elements required for hair growth. Also, add foods rich in omega-3 fatty acids, zinc, Vitamin A and C. All of these strengthen hair follicles. 2. Natural juices like that of onion, garlic or ginger are known to promote hair growth. Apply them on the scalp, leave it overnight and wash.
3. Oiling your hair is crucial. Use almond oil, coconut oil, castor oil or even olive oil works wonders. Massage on the scalp and leave it on for at least 30 to 45 minutes. Hot oil or steam also helps. Steam increases the flow of natural oils produced by the scalp. 4. Aloe vera juice is to prevent hair loss. You can also apply the fresh aloe vera gel to the scalp and the strands. Aloe vera balances the pH levels of the scalp. It is great for dry, fizzy hair. 5. Our very own desi superfood, amla is great to check hair loss. This Indian gooseberry can be powdered and made into a paste and applied. You can also mix in some shikakai to enhance the benefits. The most effective way is reduce hair fall is to drink amla and shikakai juice.